Kids can watch Derbyshire Falcons’ Royal London One-Day Cup home opener versus Yorkshire Vikings on Monday 27 July for free as part of the club’s ummer holiday special offer. The game, which will be broadcast live on Sky Sports, marks the first home fixture of the competition for the Falcons and U16s can watch the action unfold for free. Derbyshire will be looking to build on their achievements of last season where they reached the quarter-finals. 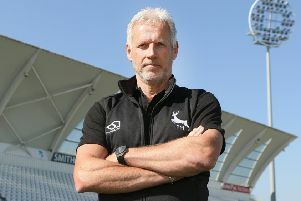 The hosts will have New Zealand international Hamish Rutherford and England hopeful Mark Footitt available for selection, while Yorkshire have a whole host of a talent including Australia all-rounder Glenn Maxwell and England trio Jonny Bairstow, Tim Bresnan and Adil Rashid at their disposal. The game takes place the day after the Falcons begin their competition with a trip to play Somerset at Taunton, which comes on the back of three days of cricket against Australia in the Bell & Co Tourist Fixture.